MEIYSH is a registered brand in United States. We are specializing in many kinds of wedding accessories for brides, bridesmaids and flower girls. Our hair accessories, necklaces, earrings and bracelets jewelry sets are all designed to be inevitable incredibly stunning ornaments for women and girls on special occasions including weddings, proms, homecomings, pageants, and Quinceanera party. Meiysh Fashion Women Jewelry, Perfect for yourself or your friend. Great Gift Choice. The pill box hat, one size fits all,Size: about 7.2 x 8.2 x 1.5 inches (L x W x H),Weight not heavy. Material: mesh, bead, wool felt pillbox. Occasion:christmas, new years eve,wedding, bridal shower,baby shower, church, Halloween, festival, Victoria costume, cocktail hat. 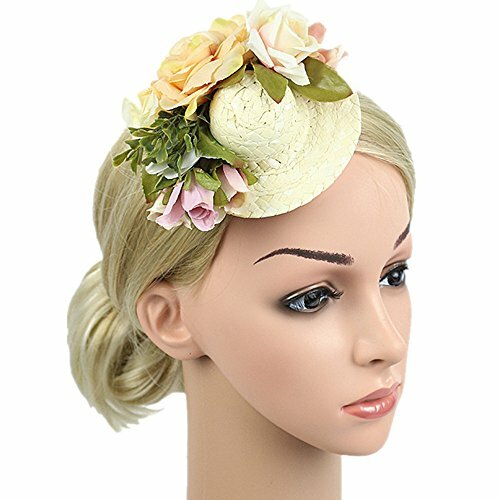 Features: an elegant fascinator hair clip for women,well crafted, hidden clip provides a secure, tight fit and fit all adult women. The pillbox hat is suitable for womens, whether long hair or short hair, still can bring out its beauty. If you have any questions about this product by MEiySH, contact us by completing and submitting the form below. If you are looking for a specif part number, please include it with your message.